LankaWeb – WHY AND HOW MR LOST IN 2015! ANOTHER REGIME CHANGE…? WHY AND HOW MR LOST IN 2015! ANOTHER REGIME CHANGE…? The UNP, written off as a party of the past, till the Badulla Provincial Council election showed it’s result; Mahinda Rajapakse (MR) rejoiced ruling the majority Sinhala voters, as he pleased. They standing firmly behind him. Results showed, in predominantly Sinhala electorates with a diminutive minority vote, where extreme Sinhala activists like Cyril Matthew and K.M.P. Rajaratne held sway: UNP was ahead and gaining ground. A singular crusade – unknown – was in motion – underground in the Sinhala electorates. Both major parties failed to crack the code. MR called for early Presidential elections, with troubled economic times looming ahead; sought nodding astrologers to find auspicious dates to suit his timetable. His brother Gotabhaya wanted him to complete the term to display more work attended. His plea was rejected on the grounds Gota did not understand politics”. 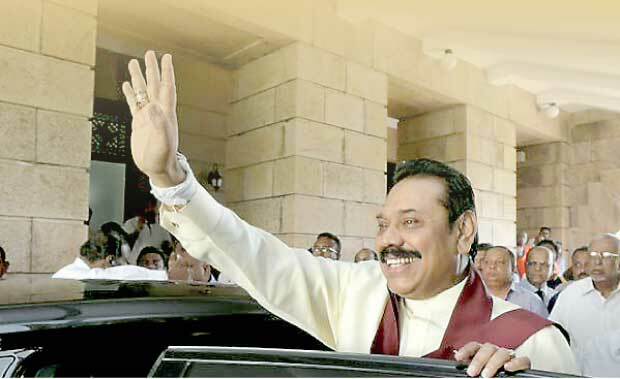 Lesson Rajapakse had not learnt – expectation of winning a third term without an ongoing war? Can he win the fourth round with two fresh generations walking to the polling booths since 2005? Teaching Government, J.R.P. Suriyapperuma splendidly predicted the existence of two power blocks in then Ceylon. Floating voters or the soft cadres of minor parties gravitate towards one or other major power blocks nearing election date – Example: immensely popular Sarath Muttetuwegama contesting in communist colours led opinion polls till a week before elections in backward Kolonne; made him a poor third on election night. So is it today – where soft JVP/JHU/Left voters switch votes on election eve to beat a common enemy irrespective of their leadership froth – forthcoming election will be a contest between the UNP and the Joint Opposition – Sirisena’s SLFP is treated a mere appendage of the UNP. MR thought Badulla needs a touch up (he had done worse in 2005 in these same electorates but became the President at the same election. Note: Most Northerners did not vote in 2005 and 2010) His campaigners failed to detect his Sinhala base was evaporating-tired of an overdose of Rajapaksa styled governance, failing to maintain law and order. Ranil Wickremesinghe savoured victory and did nothing more – lacking the will to take off on a victory drive? A people driven covert movement was rising since the UNP in its lackadaisical ways were not capitalizing on the success of Badulla. Danger signs beckoned MR, from the unknown. He knew to out- gun a known enemy. Church activists noticed the first reading of a switch in voting patterns at their seminars in the north – western province and the catholic belt – that voted heavily for MR in 2010 and at the subsequent local government elections. Roaming public servants receiving reports – began deserting MR in hordes. He had faith in Archbishop Cardinal Malcolm Ranjith and felt he was safe (another deception?). News through church sources, reached an active bunch of genuine good governance kids. Refrain best to bellow was selected by the NGO backed church – media activists as Good Governance. On soundings came back coined ‘Yahapalanaya’. A theme that was never to be! The Buddhist clergy and its sages like Gunadasa Amarasekera, Anil Amarasekera and Anula Wijesundera missed the bus, lazily watched the political releases of the pro Rajapaksa media outlets – public and private. Grand Old Man of Sinhala opinion, evergreen Gunadasa Amarasekera became a loyal disciple of Wimal Weerawansa and lost his bearings. Good men go to rut with age. This was an election, where the church and mosque beat the temple and the South lost to the North and East. Yet the Buddhist clergy demand the 1978 constitution retained: which staged the regime change (2015) by its weighted voting stimulations. Learned or otherwise, monks should keep to subjects familiar or seek advice without shooting their mouth on matters little known. To cap operations, the movement required a politicized saffron robe with a name to give leadership and turned to Ven. Sobitha Thera, crusader against the political package of Pieris-Thiruchelvam- Chandrika (CBK): later an anti-MR moderate. Good governance kids and NGO types, worked zealously to amalgamate anti-MR forces under a symbolic quasi-Buddhist leadership where all denominations used the popular monk as the convenient icon with foreign backing. They were nobodies during the war and were anxious to become somebodies during the campaign of 2015; did it in style. Flaw came with the UNP permitting CBK to enter the scene. She ousted Ranil for Sirisena and a coalition for a pure bred UNP government. She took over the show till Sirisena realized the folly and became his own man. UNP in a coalition cannot work to their biddings and a lopsided government is operating in an uncoordinated manner. Ranil and the UNP do not know of their respective strengths and together act woolly headed. In the East, Governor of the Province (2015) misread the Muslim vote and fed Colombo with inaccurate information while the wily Muslim politicians of the East took an able man for a ride. Governor appeared lost in his province. 2015 was the election where the minority vote played a pivotal role. 1978 constitution gave a weighted vote to the northern and eastern voters as against a divided South in the selection of a President, which is a frontrunner to a General Election. If the 50% mark was not recorded, second preferential vote is counted. A candidate to win needs a substantial minority vote if the Sinhala vote is decisively divided. Minorities render a block vote to their preferred candidate. That helps them to beat the majority Sinhala aspirations if it breaks close to even. Shades of it were noticeable in 2015. MR campaigners erred inputting a small turn out from the North (as previously). This was the moment the Northerners were waiting for to display their venom for being caged in security zones, far too long. Rajapaksa folks anticipated, gains of the UNP, be off set by a mighty southern vote, avalanche that failed to materialize. Jaffna district voted 66% in 2015 as against 25% in 2010 and 8525 votes in 2005 with the LTTE prohibition. Northerners stayed indoors till past noon and poured into the polling booths after 3.00 pm when most of the SLFP operators in Jaffna were closing shop satisfied that voting was low and slow. It was a feint that worked. Phone calls to Temple Trees were of no avail as there was no stopper to hold the overflow of votes for Sirisena. That vote drowned MR. An election to be measured properly with the constitutional provisions in play is 2015 and more will vote in Jaffna at the next election with a divided TNA both leaning towards the UNP. That could lead to southern floods if a lopped constitution comes into operation. UNP is a bizarre political Party, allowing interlopers to call the shots and run its campaign. The real winners were the good governance kids – a genuine bunch that realized it erred, made an honourable exit without associating a muddled government, went into hiding with pride and disgust – to a rarely heard whine. A fate that awaits entering local political scene with noble intentions. The non – genuine ‘wild bunch of NGO operators’ hold office, makes money and messes the government – NGO social riders and the leftists, left behind by the rightful left to their worldly right. Ranil, the reluctant candidate has passed the baton thrice to insignificant candidates: Sirima Dissanayake, Gen. Sarath Fonseka and Maithripala Sirisena and won twice on his own to become Prime Minister at a count. UNP has no confidence in Ranil’s ability to win but repeatedly elects him to head the party and prefers to run an outsider shamelessly as a presidential candidate; the UNP support groups have no faith that Ranil is destined to win and silently applauds the party for jettisoning its leader. Floating voters floats away on hearing the five – letter name. Sad but true – UNP lives mostly in the opposition after its second tier leadership was eliminated by the JVP and LTTE with the UNP failing to give them sufficient security. Those were men: these are mice. Can Ranil commissioned a non-combatant in 2010 and 2015 expect to win after being PM for five long years? Both wings of the SLFP are outfits with leaders past their prime and their progeny in prime waiting to take over. Weep for Sri Lanka again. Left in office is a coalition where the UNP elements pick the vote and the SLFP elements lose the vote it possessed, for hibernating in the enemy camp. Much of the muck that MR carried has been absorbed by Sirisena, half cleansing the Joint Opposition, but MR is likely to open dumps and place them back on his slate knowing only his generation and their progeny. Are we to watch the mockery or should intervene to effect a change? It’s your turn, lads and lasses and old fogies need give way after defeating terrorism. Question has a simpler answer; whom is MR selecting as his next presidential candidate? This is the make or break point. It would decide which election – presidential or general, shall be held earlier? That result would tell the end story. Gomin is the best political commentator. Dispassionate and objective. A comparison of total votes in 2010 and 2015 shows Mahinda’s votes by province were identical in both years (a small 250,000 reduction). I don’t think many people know this fact. Sirisena increased Fonseka’s vote by 2 million with every province showing an equal increase. Uva has a smaller increase and Western has a higher increase. This proves Sirisena beat Mahinda in every province. It doesn’t matter north or south Sirisena beat Mahinda in each and every province. Mahinda managed to retain some provinces (Southern, Sabanagamuwa and North Western) only because his starting position (2010) was excellent in them not because people in these provinces had a better view of Mahinda. For example, if X earns 1 million rupees a month, X can still survive a 600,000 rupee expense hike but if X earns only 500,000 a month, such a hike will ruin X. The expense increase of 600,000 rupees is a fact. Although election fraud helped Sirisena and he is the most useless president in his first term, increasing votes by 2 million in just 5 years is some achievement. According to above, Gotabhaya has shown remarkable insight in dissuading Mahinda for an early election saying insufficient development work. He is right. Despite borrowing $40 billion, there were not many useful (emphasized) development work in Mahinda’s second term. I said the same thing since 2013. Mahinda and Gotabhaya openly disagreed on 13A too. Mahinda had dismissed Gotabhaya saying he knows nothing about politics! For Gotabhaya to come to the fore, it has become essential to remove Mahinda, Basil and Namal. The same thing happened in 1991 when Sirima removed her politically experienced son Anura in favour of politically novice Chandrika (who abandoned 4 parties by then). Anura joined the UNP and campaigned heavily against his sister. She turned things around winning for the first time in 21 years an election for the SLFP in 1993 and kept winning all elections until 2001, the longest winning streak of the SLFP ever. Chamal as the senior must make this happen in the Rajapaksa clan. Gotabhaya is not known for nepotism which means Rajapaksa clan as rulers will end in 2025 or 2030. Without him, the clan has already run its course in 2015. Quote from Dilrook’s comment ” For Gotabhaya to come to the fore, it has become essential to remove Mahinda, Basil and Namal. ” . What has to be done is acceptance or acknoweldgement of ALL MISTAKES done by ALL and explain to public how and why it will NEVER BE REPEATED. Problem is that is unlikely. Now the moto being promoted is “VENESA SAPADA ?” extremely insulting stupid words blaming public and the voter. STUPID. The 2015 Sri Lankan Presidential election: How it happened? What it means for Sri Lanka (Ceylon)? What it means for the Indian Empire (Indian Union & its colonies)? The former President called an early election. The Indian imperialists (Indian Union) were ready to correct its mistake in 2005 when it backed Mahinda Rajapaksa over Ranil Wickramasinge. Then, Indian imperialists advised Indian block vote in the island to abstain from voting. The reason for the preference was Indian imperialists thought it will be easier to negotiate with Mahinda an unknown matter for India compared to Ranil who is a bit erratic. When profiling Mahinda they did not take in to account his brothers, in particular Gotabaya who was in the US at that time. Unfortunately for India, Mahinda did not follow Indian directions as former Sri Lankan leaders did since 1956. In 2010 India enrolled General Sarath Fonseka as a presidential candidate against Mahinda and failed. So behind the scene as Indian imperialist always do they were planning for years and had got former governor Chandrika Bandaranayake-Kumaranatunge to do the job and succeeded with doing a repeat of what India did with her father Solomon West Ridgeway Dias Bandaranayake in 1951. India did not have to wait for four years this time. India managed to divide the non-Indian vote and got the Indian block vote for Maithripala Sirisena the new Indian governor of Sri Lanka who may be the proxy for the real governor Chandrika. What it means for Sri Lanka? Nothing much. It will be the same as what the island nation had from 1956 to 2005 and before from 1792 to 1948. The Indian minority will run the country with the privileges they enjoyed since their arrival under the cover of the British fire power and their own nonviolent aggression and oppression. They will claim they are the victims of Majority Sinhala Chauvinists; the same claim that they make in other colonies from Fiji to Guyana. For example; finance and justice; most important ingredients in the world and heads of these two institutions in the island now are from the victimized minority and one of them has been brought from another colony. What it means for the Indian Empire? It means a lot to the Indian Empire. The former partner of the British-Indian Empire from Fiji to Guyana that is all former tropical colonies of the British-Indian Empire. India lost its control over the island nation since 2005 as the new government of the island nation managed to wipe out the Indian terrorist arm; trained, armed, financed, managed and branded Tamil Tigers by India. Since the election of the new governor Indian cars and food have become cheaper with reduced tax on Indian products. Indian Imperialists have already indicated massive investments and projects in all sectors of the economy. This will not be a hard act as the island nation’s economy has been in their hands for more than two centuries and the business language in the country is an Indian language spoken by more than 75 million of them in India. The wealthiest in the island are Indian though their wealth is not stored in the island but most of it in India. Reclaiming the control over the island nation will supplement its control over the Indian Ocean and Indian Ocean countries. With its unchallenged military power; with ICBMs, Aircraft Carriers, Nuke Subs, Nuke (Peace) bombs and purchase of hundred billion dollars’ worth of military hardware the island nation provides the best step with Mauritius a third State of India to lay a drag line across the Indian Ocean. Gota was given the job of fighting the war to a finish and he did it in style. Mig deal and Rajapaksa memorial are small matters. What ever it is, we need a strong leader who would remove 13A.